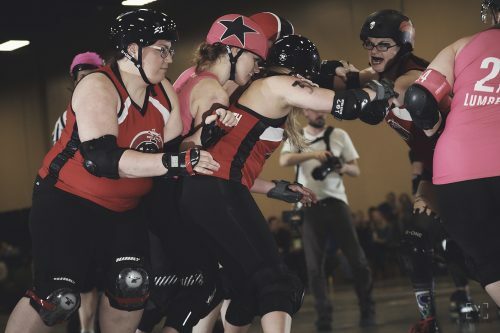 North Star Roller Derby’s 13th season of skating, smashing, and high-fiving is chugging along. We just wrapped up our semi-final bouts, Four Leaf Clobber. The third double-header of un/Lucky Season 13 kept giving unexpected blow after blow. Starting off the night was the team in red holding the pink people’s feet to the fire. Both the Violent Femmes and Delta Delta Di came into the night with clinched spots in the championship game, but did either team let their guard down? No. No they didn’t. This game was merciless and brutal, and the only things missing were the shivs. The Violent Femmes stuck a few fresh faces named Lady Gotcha and Sailor Mouth on the jam line, and they fit right in there. The Fawkes pulled in the fattest sack of points, coming in with 41, while another jamming regular Amanita raked in an impressive 36 cigars. The inside line was their friend that night as they capitalized on open lane after open lane. Big-time blocking vets Pop Roxie, Maul Bunyan, and Mean Latifah smothered any dreams Delta jammers might’ve had early on. The red blockers held Delta jammers to just 17 points in the first half—pushing the Deltas to an average of less than one point per jam. With fluid movement and supportive bracing, the Femmes’ teamwork was showing—and they weren’t about to slow down. Delta Delta Di had a rough first half (remember how I said they scored just 17 points in 18 jams?). A lot of teams would hang their heads and maybe cry a little, but the pink squad wasn’t about to call this a wash.
Delta jammers racked up 44 points in the second half, nearly tripling what they had put on the board, thanks to a mixed bag of rookie and veteran jammers digging deep and rallying hard. The Deltas were playing short long-time blocking foe, the notorious Valued Participant, but they were still able to put out some strong lines with glimmers of solid defense and smart offense. The footage shows that the chink in the Deltas’ armor was a combination of planted feet and seams left open for the Femmes jammers to weasel through, but these are easy fixes for the big game coming up. 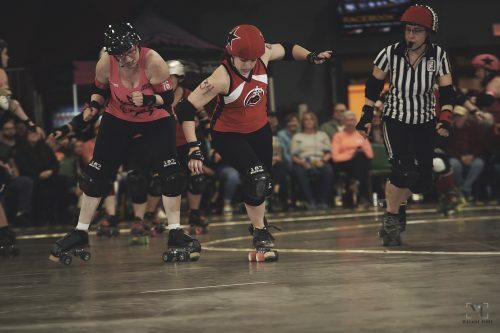 The Violent Femmes took the W with a score of 95–61, but all of this winning could be moot when the two teams face each other in the championship bout on April 20. The big finale of Four Leaf Clobber came when the Banger Sisters squared off against the Kilmore Girls. Both of these teams were vying to win their first game of the season, so we knew we’d be in for somethin’ special. In the first half, fans were treated to an impressive show of blocking. 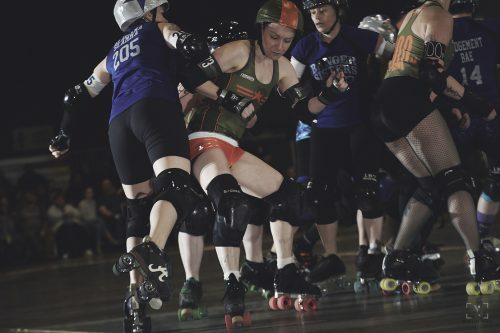 Katarina Hit of the Bangers (pulling double duty as jammer and blocker) and Red Panda of Kilmore fame were single-handedly crushing souls by always being right where jammers wanted to sneak by. Similarly, shE. coli and Weird Val Shankabitch were swingin’ their own butts and smashing opponents into the infield all night. The first half wrapped with the Bangers clinging onto a slight lead of 36 to 19. In derby, a 17-point deficit isn’t much. A slim spread like that can be shrunk with one pretty OK power jam or a couple of quick 4-pointers. But the Kilmores needed to get a little momentum going into half No. 2 if they wanted to keep in the game. Unfortunately for the Kilmores, the Bangers came out of halftime with a serious fire lit under their butts. The Banger Sisters’ jammer rotation had points being scored by shE. coli, Katarina Hit, Alabama Slamma, Miss Ornery, Judgement Bae, and (surprise jammer!) Grin Reaper. They chipped away at the Kilmore’s shot of taking the lead with short-and-sweet jams, but the real nail in the coffin was a whopper 20-point beast by the Bangers late in the second half. The Kilmores were fighting with some hard hits and fast runbacks, but they weren’t able to steal momentum and switch the game around in time. They fell to the Bangers with a final score of 37 to 106. Taps played softly in the background. I raised a corndog in their honor. 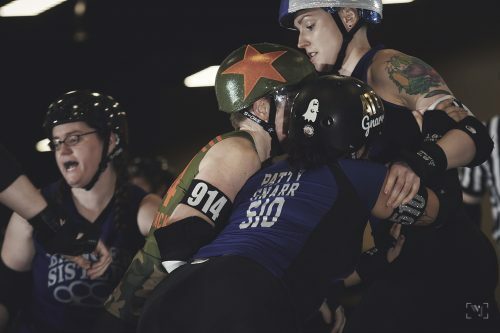 Let’s do this all again at North Star Roller Derby’s championship bout, Count Your Lucky North Stars, on April 20 at the Minneapolis Convention Center! Grab your tickets now! Will the Kilmores avenge their name? Will the Femmes take the trophy? Well, you’ll have to come and find out because I really don’t know.